Injection blow moulding is used in the production of large quantities of hollow plastic objects. The process starts with the injection moulding of a polymer onto a core pin which is then rotated to a blow moulding station to be inflated and cooled. 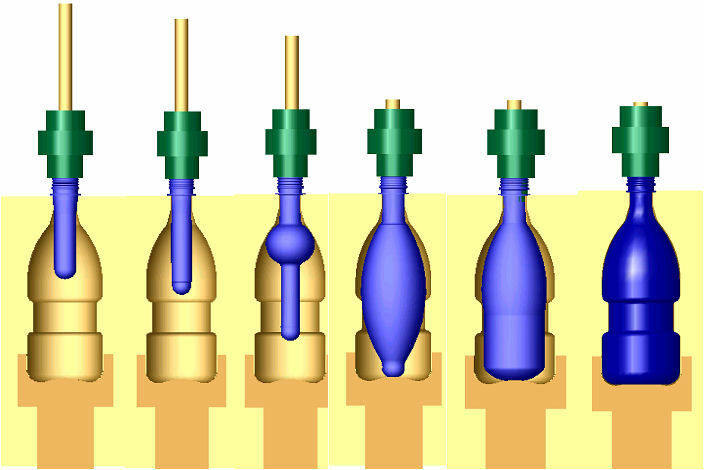 Typically used to make small medical and single serving bottles, injection blow moulding is the least-used of all blow moulding processes. Extrusion blow moulding can be used to process many different polymers including polyethylene, polyvinyl chloride, polypropylene and more. The process begins with the conventional downward extrusion of a tube. When the tube reaches the desired length the mould is closed catching and holding the neck end open and pinching the bottom end closed. Then a blow-pin is inserted into the neck end of the hot tube to form the threaded opening and inflate the tube inside the mold cavity. When the mould is completely cooled it is opened to eject the bottle and the excess plastic is trimmed from the neck and bottom areas. The main applications of stretch blow moulding includes jars, bottles, and similar containers because it produces items of excellent visual and dimensional quality compared to extrusion blow moulding. The process first requires the plastic to be injection moulded into a 'preform' with the finished necks (threads) of the bottles on one end. The preform is then heated above its glass transition temperature and blown, using high pressure air, into bottles using metal blow molds. At the same time the preform is stretched with a core rod to fill inside of the mould. Strain hardening occurs as part of the stretching process of some polymers (such as Polyethylene Terepthalate) which allows the bottles to resist deforming under the pressures resulting from carbonated beverages (typically around 60 psi).